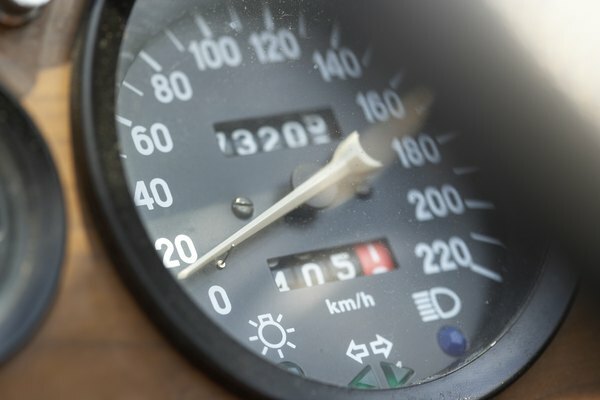 Buying a high-mileage car requires effort on your part to ensure a good purchase. The days when you had to haul your car off to the junkyard after 100,000 miles are long gone. Thanks to advances in automotive technology and convenient, inexpensive ways to properly maintain vehicles, modern cars last much longer than they used to. It's not unusual to see high-mileage cars -- those with at least 100,000 miles on them -- for sale at used-car dealers and in classified ads. High-mileage cars are usually less expensive than their lower-mileage counterparts, though prices vary based on the type and condition of car. If you are interested in buying a high-mileage car, it pays to be diligent to ensure you don't drive off in a lemon. Examine the car for obvious signs of external wear and tear. 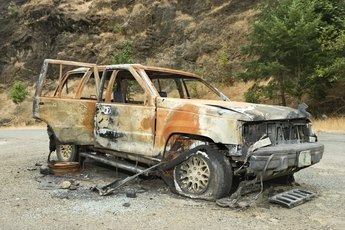 Vehicles with high miles often show it with dings on the exterior and tires that are worn and punctured. Tires with uneven wear might indicate that a car is out of alignment. Also keep an eye out for body rust, which is another sign that the car has a lot of wear and tear on it. Look over the interior for seat wear, broken accessories or cracked plastic. Many high-mileage cars have headliners that are loose or hanging down. Droopy headliners are tricky to fix and can cause vision problems. Excessive wear and tear in the interior is a sign the car may not have been cared for by its previous owner. Double-check the vehicle's mileage using online resources. Car history information is available through websites operated by Carfax and Autocheck. These sites will include reports on accidents involving cars, insurance claims made on the car and ownership changes. 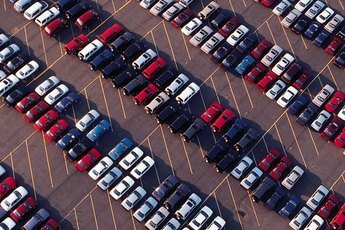 You can research specific cars by entering the vehicle identification number. Most sites provide access for a fee. Be sure to pay close attention to the mileage of cars when the incidents were reported. For example, suppose the car you are interested in was involved in an accident in May 2008 and the mileage was listed as 108,445. A couple of years later the car was involved in another accident and the mileage was listed as 107,680. This is an obvious red flag that the odometer was tampered with. Pay attention to any engine problems. Ask the seller if it's acceptable for you to take the vehicle to a mechanic for a compression test to be conducted on the car's cylinders. A compression test determines if all cylinders are firing properly. If they are, the cylinders should measure within 15 PSI of each other. If you don't want to go to the trouble, or don't have a regular mechanic you can rely on, take the car for a drive and pay close attention to the sounds you hear. Listen for any unevenness or hesitation in the motor as it accelerates. If it lurches or seems jerky, the car might have engine problems. Also, if you hear any knocking noises in the engine during your test drive, take the car back immediately because it probably has major engine issues. Look for smoke. Blue smoke from the exhaust signals that the car might be burning too much oil. Black smoke means there might be a problem with the fuel system. White smoke indicates that antifreeze is burning, which can be a sign of head gasket problems. In a vehicle with few or no mechanical problems, you should see nothing coming out of the tailpipe. Make sure the car isn't burning excessive oil. Burning oil is a sign of engine problems, too. Check the oil using the dipstick under the hood. If you see a low reading, it might be because the car uses excessive oil. You can also check the tailpipe. If it's extremely black, it's a sign that the motor is burning more oil than it's supposed to. Vicki Wright, writing and editing professionally since 1996, has extensive business management, marketing and media experience. Wright has a Bachelor of Science in socio-poltical communication from Missouri State University and became certified as a leadership facilitator from the Kansas Leadership Center in 2010. 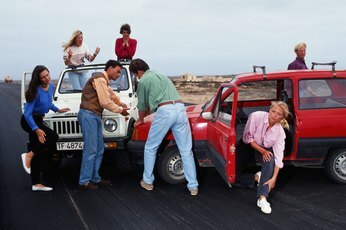 Does a Car's Trade in Value Drop If It Has Been Repaired After an Accident? How Does a Hybrid Car Help Save Money? 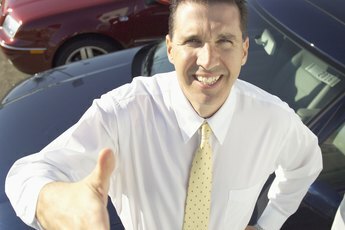 Do I Need to Tell the Dealer That My Car Was in an Accident & Repaired When I Trade It In?